I love using my 28-300mm zoom lens with my Nikon D700, but I sometimes forget to take advantage of the great depth-of-field opportunities it provides, especially when I’m concentrating on capturing brackets for HDR processing. Yesterday at the abandoned dog track, I actually remembered to play around with the focal length on the lens. I lowered the height of the tripod to about knee-level, and then aimed the camera down the front row of seats in the “yellow” section. I focused on one of the seats about a third of the way down the row, letting the other seats go slightly out of focus. I was using a focal length of 92mm, at F/10. I find that HDR processing is complicated a bit by using these shallow depths of field, because the areas that are purposely left out of focus can actually turn out worse during the HDR process. For instance, in this shot, I wound up with some obvious chromatic aberration along the mountain tops in the background. Probably should have spent some time trying to fix it, but hey, I was tired. I’m still going through the rest of the shots and trying to decide which one I want to work on next. So much to choose from! This entry was posted in Information, Processing, Shooting and tagged 28-300mm, abandoned, architecture, Arizona, AZ, Black Canyon, building, camera, D700, depth of field, f-stop, grandstand, greyhound, HDR, nikkor, Nikon, Paint Shop Pro, park, Photomatix, software, Topaz, tripod. Bookmark the permalink. another great shot….i love abandoned buildings….there are many stories to each one…. Wow… you were not kidding about the glass. Awesome shot! I love it. The dog track became a favorite of mine just after Christmas when we were up there shooting. Very nice image, Zann. 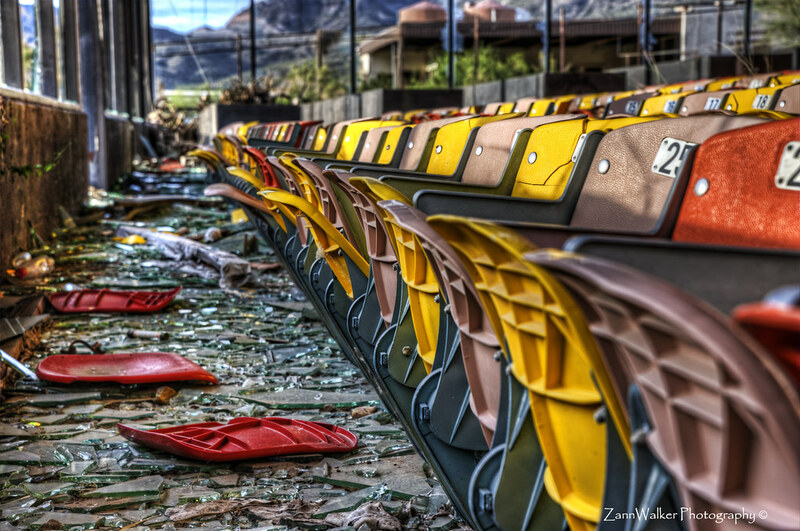 I’ve seen various images from the dog track and of course most of them emphasize the look of dark decay, but the way you handled the color and clarity of the seats puts a new twist on this popular subject.